Santorini sailing holidays and luxury yacht charters in the Cyclades, Greece - Santorini gulet cruises. 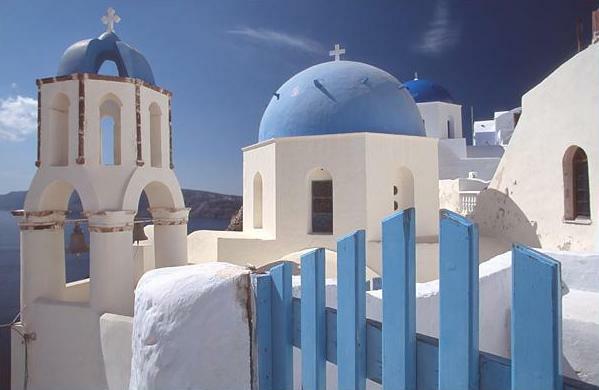 The islands of Santorini in the south Cyclades are by possible the most romantic holiday destination in the world. Especially Fira town (Skala) - perched at the edge of the impressive cliffs that surrounds the now flooded caldera of this volcano - is ideal for greek weddings and honeymoons. Indeed, the sunsets casting a last yellow reddish glow on the churchbells and copulas of the island is one of the most photographed scenes in Greece and the apogee of many yacht charters and sailing holidays. Santorini consists of several islands: Thira, the most important island, Aspro and Thirasia are part of what was once the large volcano and now surround the flooded caldera. In the middle of the Caldera two newer islands have risen to the surface and these form the current volcano, note that Santorini is still active. Personally, I feel that the best way to appreciate this miracle of nature is by either sailing yachts or luxury motor yachts or gulets and simply cruises around and underneath the magnificent cliffs of Santorini and Thira. During our last sailing holiday in Santorini it was the highlight of our trip!
. : Back to yacht charters Santorini in Greece :.